My son and I found this rock with shell fossils on a small island by Puerto Rico. Any ideas what the shells are and about what period they are from? gigas is probably correct. They are relatively common and obvious in Pleistocene deposits in many parts of the Caribbean; I have seen them in various places in the Bahamas. Yes, the fossil is very definitely from Strombus gigas. I also have a piece of one collected there about 10 years ago. The place is Icacos Island, off of Fajardo, Puerto Rico. 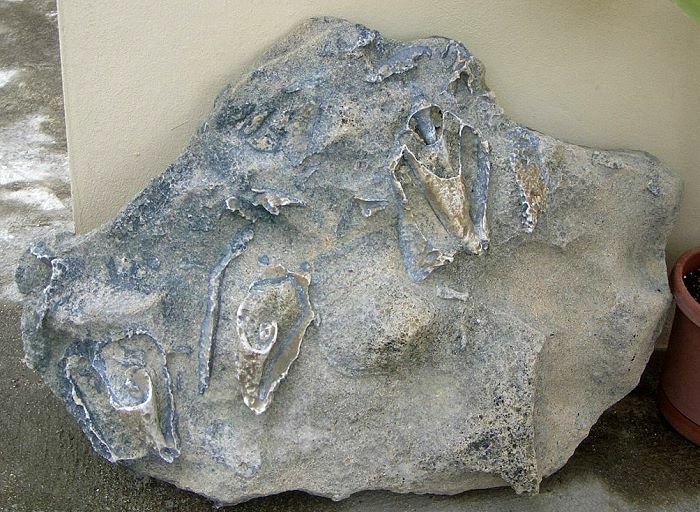 The mistery fossil could be an Strombus. Like the canarien Strombus bubonius ( antecessor of St. latus)...Jose H.
gigas remains moderately common, though overfishing is a problem in many areas. Although a fossil specimen is not as colorful as a modern one, it may be easier to convince a customs agent that you did not collect it alive than if you find a nice empty modern shell. There are many species which have been in existence for a long time. Therefore it is possible to find fossil specimens of them as well as living specimens...Paul M.